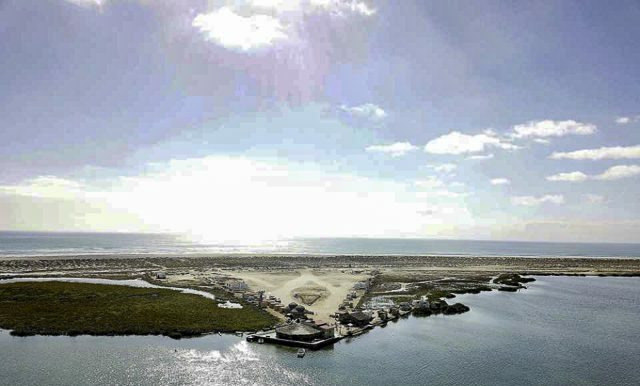 Discussion in 'Baja Bytes By Gary Graham' started by Baja Bytes, Jan 3, 2019. 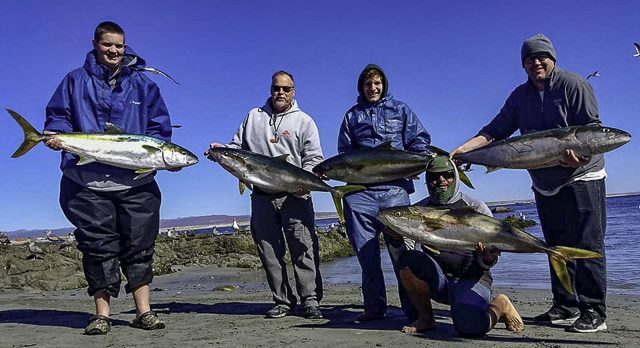 We have long believed ourselves very fortunate to have made so many friends along the way these past 50 years in Baja bytes and beyond, whether through fishing or any of our many other projects. There’s hardly a day goes by that we don’t communicate with some of you, whether by social media, phone calls or in person. We enjoy your friendship. You have made our lives interesting and exciting. 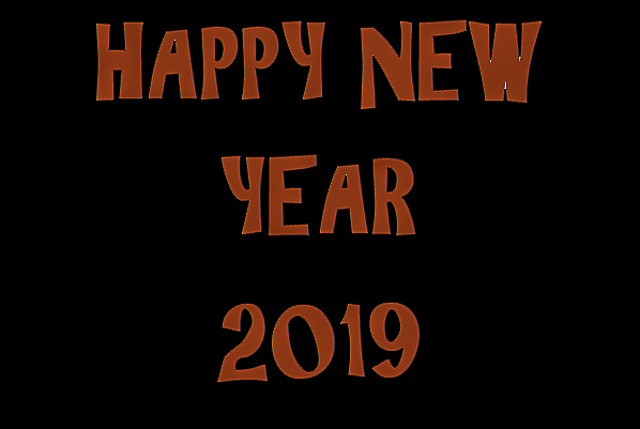 And we look forward to sharing with you whatever Baja bytes has to offer in 2019. 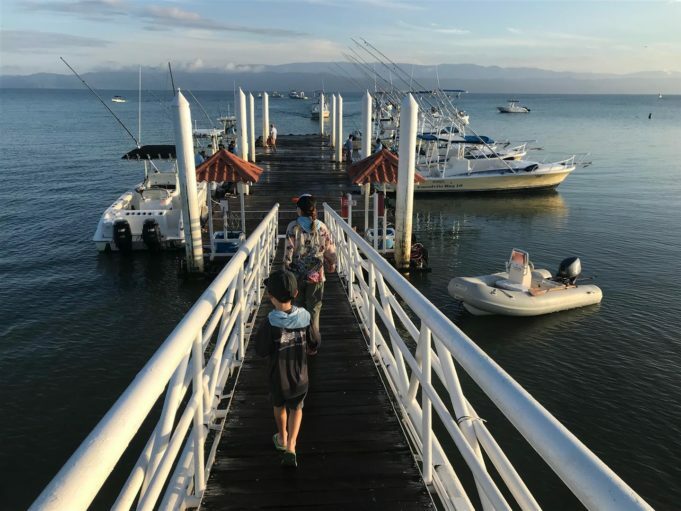 There have been rumors on various forums that the Annual Mexican Fishing License are being discontinued and only daily ones will be issued in the future. 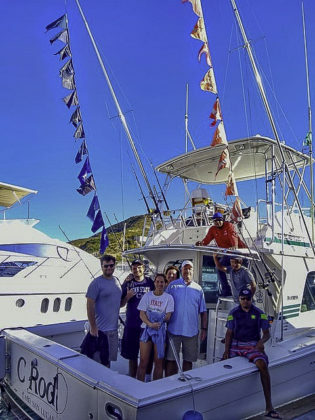 Upon doing some research and checking with Rebecca Ehrenberg of Pisces Sportfishing, Cabo San Lucas, she confirmed that the system is down briefly due to the change in Government Administration and new licenses are in the process of being printed. So, my suggestion is that you check before going out to see if new Mexican Fishing Licenses are in print yet. It’s always best to be prepared! Rockfish remains the number one catch although the red crab is hindering the amount of reds going in the bags. Yesterday saw one yellowtail caught — the first in a long time; still one fish doesn’t mean much. That same boat that caught the yellowtail also caught about 20 big bonito. The attached two yellowtail were caught a couple of miles north of North Island in 230 feet of water. The larger one was caught on a Lucanus 200g Orange and White (go figure). The other was a 160g Sand Eel flat fall. There was great rockfishing as well. It was a flat calm day on the water. First trips of the season are happening now. So far it is all quality reds with a few lingcod being caught. The high spot got looked at but there weren’t any signs of yellowtail. We expect a lot more of these trips to be running over the next three months with rockfish being closed in U.S. waters. Out fishing with my friends, Mr. Mike Halligan and Francisco; the weather was crisp at 46 degrees. However, it warmed up early and Mike caught a rare Kawa-Kawa tuna. We haven’t seen one of those in a while. It was good winter yellowtail fishing on the high spots with all caught on jigs; we caught two but other boats had more hookups. Also out fishing were my friends Robert Robertson and Todd Philpps who were on the fish as well. I took a few photos of the Campo Rene area with my drone. Enjoy. Plus a few fat yellows just in time for Christmas! It’s the closing week of 2018 and true to its being late December, the cold north winds showed up with a few days of daytime 20-knot winds along with whitecaps. No tears! It’s the schedule for the season but outside of those specifications we still have relatively warm water. Dorado are still in the area and any one of the daily trips can score with sardina. Most of the dodo have been found along the coast going to or on the return from cabrilla country. 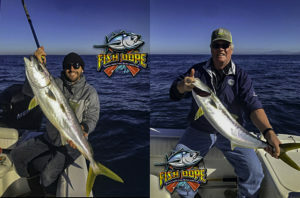 Shallow-water yellowtail events are also on the “hit or miss” menu for those people soaking live bait along the coast. No news from the farther off yellowtail spots and the upcoming north winds will be the limiting factor for those destinations. If the luck of the great fall fishing holds, we should have a super winter bottom fishing season. Yellowtail, pargo and baqueta will be on ice in the coming weeks. 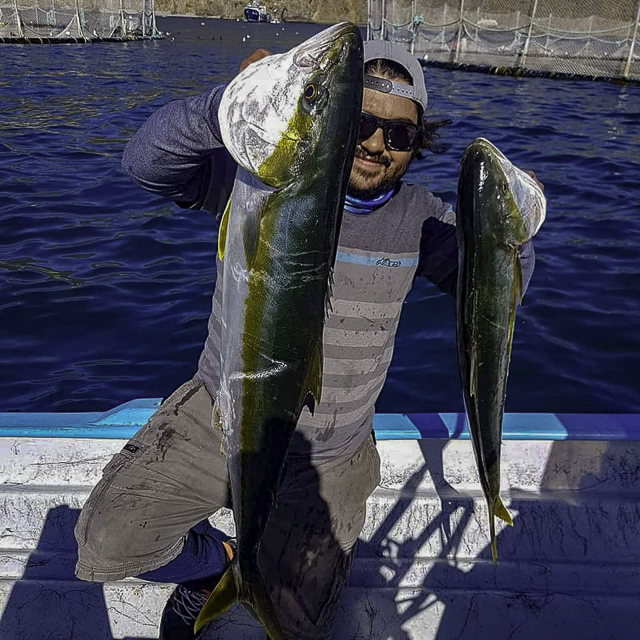 Maybe the summer of 2019 will have all this past year’s 12-inch dorado returning as 40 pounders! This is the first December in many years that gamefish are still biting, although the difficulty is that we have run out of anglers who want to fish. Plus, the weather has also been an issue with strong north winds blowing five days out of seven. Many local anglers are checking out the wind conditions before they commit to fishing. If the wind line is offshore far enough, they will launch their tin-boats and troll close to shore for sierra mackerel, small roosterfish and jack crevalle. We are seeing a fair number of families visiting for the holiday vacation. 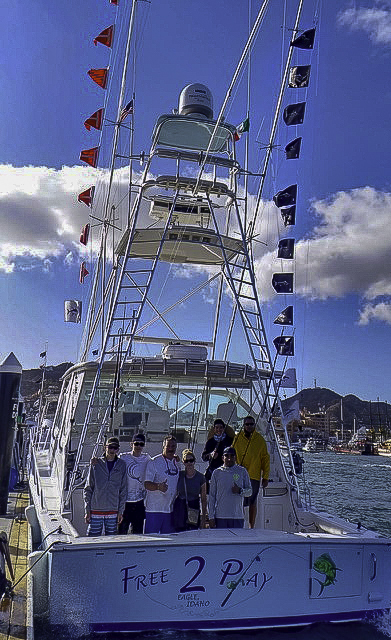 However, with continued north winds the fishing has been subpar on the local grounds out of San Jose del Cabo. Winds have been relentless since November, and conditions have turned over; the water is greenish with swift currents and water temperatures near 73 to 74 degrees. Anglers are using a combination of caballito, slabs of squid and some ballyhoo for bait. There are now reports of mackerel showing up on the bait grounds off San Jose del Cabo; if wind and water conditions settle some, this could open up some new options and bring in gamefish species such as striped marlin. Most local charters are fishing the grounds from Red Hill, Gordo Banks to Iman Banks. At times there area where boats could comfortably fish is limited due to weather conditions. Air temperatures have been moderate, lows down to 55 degrees early mornings, with mid-day highs near 85 degrees. There are mainly sunny skies, with morning cloud cover burning off as soon as the sun rises. 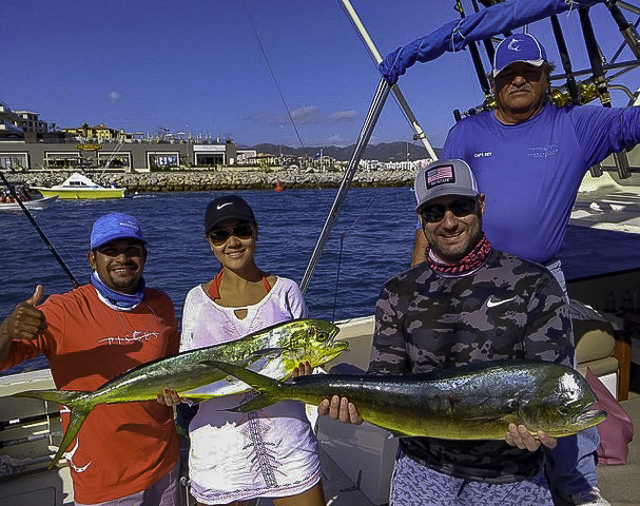 Yellowfin tuna, dorado and wahoo action were all very scarce. Best chances were for a tuna or two near the Iman Bank, but only a handful of yellowfin tuna were being landed; boats were lucky to catch one. Most of the tuna landed were in the 15- to 20-pound class, and they were biting strips of squid. An occasional dorado was being seen, and there were even fewer wahoo. The more productive action recently has been for a variety of structure species — the most common being the Eastern Pacific bonito, ranging up to 10 pounds, striking various lures as well as bait, plus red snapper (huachinango), glass eye snapper, baqueta, triggerfish, ocean whitefish, yellow snapper, flag cabrilla and tijareta. Nicholas and Dan Raff released 18 striped marlin on Pisces 31-foot Rebecca at the Finger Bank. Numbers at a glance: Billfish 56%, tuna 35%, dorado 14%, other species 3%. This past week, most of the fleet enjoyed releases of around 10 to 15 stripeys on the Finger Bank, while the 52’ Free 2 Play had some great action with up to 18 striped marlin in a single day of fishing! Although we have seen marlin and tuna numbers go down a few percentage points compared to the last few weeks, some of the tuna caught have been of great size! Most have been smaller, however, around the 20- to 30-pound mark, but we have seen a couple over 100 pounds hitting the dock. The largest tuna recently caught, a nice 132-pound yellowfin, was aboard the 31’ Tracy Ann, taken by angler Abigale McGee from Montana. 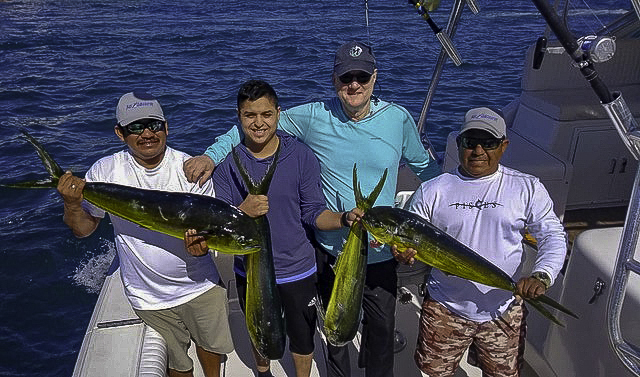 The dorado numbers have increased and the dorado that were caught were specifically targeted as they were found in different locations than the marlin and tuna. 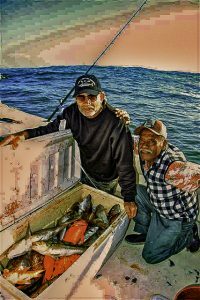 Pisces 31’ La Brisa caught 7 dorado when they searched them out specifically at Migrino. They used black/red lures, mackerel bait and ballyhoo. 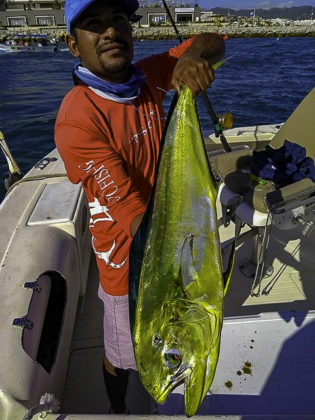 The dorado all weighed between 10 and 15 pounds. La Brisa caught several dorado in the 20-pound class on ballyhoo between Golden Gate and San Jaime, along with 6 skipjack of about 15 pounds. On the same day, the 32’ Bill Collector caught 4 dorado weighing between 10 and 20 pounds, also using ballyhoo in the Golden Gate area. 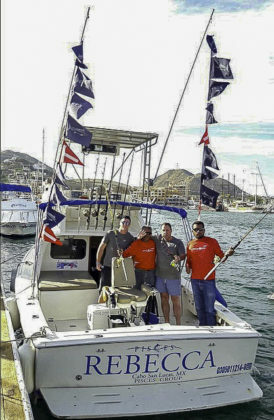 Several of the panga fleet that were fishing closer to shore for small gamefish scored; they were catching sierra mackerel up to 8 pounds which were great for ceviche, plus, they caught skipjack and bonito — always favorites for first-time anglers. LOCATION: Finger Bank, Golden Gate, Migrino, San Jaime Bank, 270 Spot. WEATHER CONDITIONS: Sunny and overcast; there were a few days with calm seas, but others had some wind and chop. We all know New Year’s resolutions seem to be for areas of physical improvements, i.e., I’ll eat less, I’ll work out more… how about do something you’ll stick to… I’ll fish more!! That, Casa Vieja Lodge can help you make happen! You may own a boat with intentions of going fishing more often, but we all know how that goes. One needs to wake up early, haul the boat to the marina, buy the bait, prepare the tackle, load the boat with rods, food and beverages. Mostly likely you’ll have a very long run out to the fishing grounds, albeit not in calm or warm conditions, but it’s worth it when you get that first release … if it comes! At the day’s end, you’ll need to wash the boat, all the equipment, clean the fish, and haul it back home. Whew! 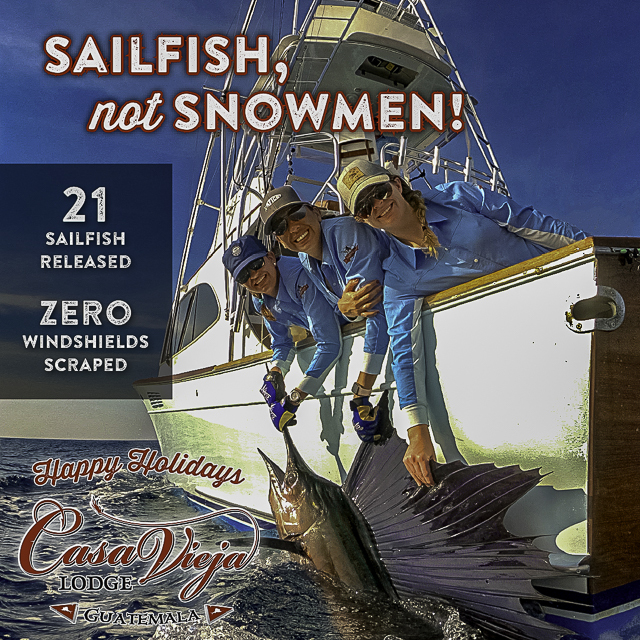 Casa Vieja can assist you with the fun part of being out on the water. Let us take care of every detail and you just catch fish, lots of them! Hot mahi mahi sandwiches aboard the boat which requires no cooking and cleaning from you, but no pressure to catch it as we also have cheeseburgers available! By the way, you can also wake up an hour before fishing and enjoy our state-of-the-art gym to stick to that ‘ole lose weight resolution too! Awesome report and pics, and HAPPY NEW YEAR To you and Yvonne TOO!